... and it was all yellow. Greg's Birthday Trip to Colorado. I love watching him love our babies. and watching them love their daddy. I love this amazing man. It's hard not to act like a three year old when you live with one. Her laugh is the sweetest thing I've ever heard. She's everything we ever dreamt she would be and more... and she's only 3. Our little family brings me more joy than I ever thought imaginable. Greg snapped some of me when I was laughing with Haven. He also insisted I journal these on here. So you can just pretend you didn't see these. It's true. He really does. We were so proud of how well she handled my big camera while taking her first photos. Most of the pictures she took were great shots of the trees and our foreheads or the ground with our feet in them as she wielded the camera around. She kept laughing and telling us she got a picture of the sky or our feet. We were laughing so hard... we're lucky we got this one! I just love her... and her fun helpful little self. he runs his fingers through his. I love it. We got to see some beautiful deer and does out back. yet my babies didn't think those deer were as cool as this singing dear head in the garage. For Greg's Birthday Dinner he made his AMAZING homemade pizza with Haven. I normally don't like soda... I'm not a fan of carbonation... except when it entails delicious pizza and rootbeer. It's the most wonderful combination ever. We went to Tequila's Mexican Food restaurant... twice. Oh. My. Goodness. They have THE MOST AMAZING Carne Asada... chips and salsa... and beans... yeah... I said it; beans. EVER. More like the only beans I eat. Ever. I hate the consistency... but these... oh they transcend any other. 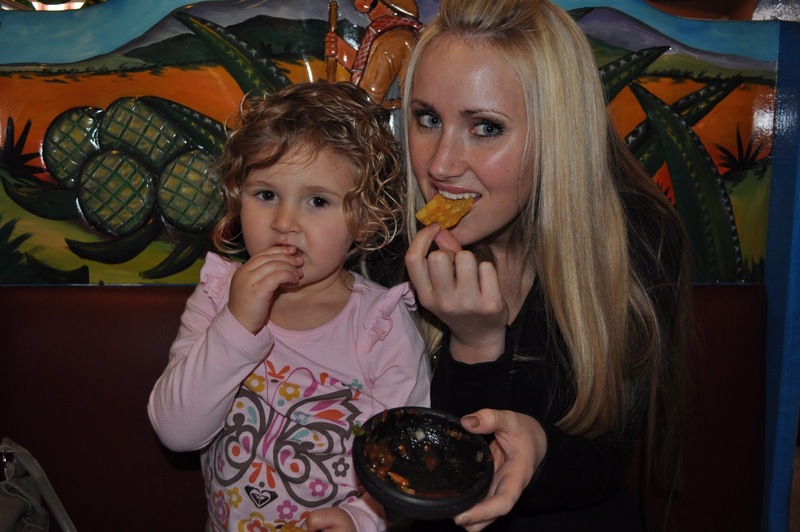 We cannot get enough chips and salsa. Honestly. Our servers know to bring it to us by the truck-load 'cause the only two people who love them more than Greg and I are our mini's: Drake & Haven. Yeah... and it's spicy too. I love my little salsa connoisseurs. 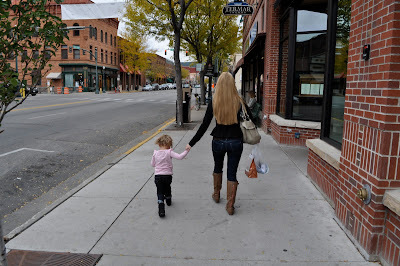 we strolled down Main Street in Durango with our little family. Oprah even fell in love with Durango on her road trip of the U.S. with her friend Gayle. Here's Haven pointing at a picture they took at Through The Lens. We took some pictures at Through The Lens after the Harley ride this past Aug.
Let's just say it was an experience. Drake was out-of-control to put it lightly. Rocky Mountain Chocolate. Cold Stone. Hot Chocolate. My sweet husband. Haven. Drake. Yeah... that's really how Mr. Johnny Starbucks spelled my name. Nice. These two make my heart swell with joy. They laughed and splishy splashied together. We went on drives just to take all the fall colors in. As you can tell... I seriously cannot get enough of these colors. We went Jeepin' up Middle Mountain. Yes... he still HAD to go up it. He's such a boy at heart. Drake slept through it... and Haven was like the little piggy going WEEEEE WEEEEEE all the way down. She loved every second of the bumpy climb. I love the mix of the deciduous and evergreen trees EVERYWHERE. As we got higher the clouds dusted us with snow and all the trees looked flocked. her very own SNOW BALL! it was one DIRRRRTY ride. We drove up to the cabin to celebrate Greg's 29th. what he got were mine... a la mode. It was so much fun watching Greg open our gifts. I think his favorite was the book we got him entitled "Joseph Smith - The Prophet" written by Truman G. Madsen. He LOVES how Bro. Madsen makes the prophet, Joseph Smith come to life with his descriptions of him. He's spent so much of his life studying his exemplary one as well as the beginning of our church. Greg has audio copies of talks he's given but since the book is out now... Greg's sure happy. So are Haven and Drake 'cause it's illustrated... they love being read to. which was nice 'cause neither did we. Here's Haven wearing her "Lion Jacket"
just like a LION! RARRRRRR!" Apparently Haven didn't realize you need only add a capful of soap when jets are involved as a PLETHORA of bubbles is sure to ensue. They couldn't have been happier with the result though. Haven loves making "snow men" with the bubbles while Drake just loves flinging it at the walls. We watched "How To Train Your Dragon"
The kids LOVED it... and so did we. especially all of the older family photos that she's updated with new frames. Below is one. I knew that Greg had come from a long line of Updike photographers but I didn't realize the extent until this cabin trip. I read a lot about his great-grandfather Lisle Updike in a book entitled "Glass Plates and Wagon Ruts" by H. Jackson Clark. He was a very fascinating man. It's humbling to think of all they had to go through to get a photo. He traveled thousands of miles, by horseback and sometimes with wagons with his HUGE camera, all the photography equipment & paraphernalia, which back then was a ton. To top it off he had the most apprehensive subjects ever who felt that a photo would literally steal their soul. Yet he was not only able to capture their culture beautifully, but he would ALWAYS make the long arduous trip a second time... just to give them prints once he'd gone all the way back to his studio in Durango, CO to develop from his glass plates. He was one of the first photographers paid by the U.S. government to capture images of various unknown Indian Tribes cerca 1906. It was so neat to read about him at the museum at Mesa Verde National Park. He was one of the first to take photos of the amazing cliff dwellings there. I'll have a separate post about our trip there shortly. Orange Juice and a HUGE cup of Hot Chocolate. They loved EVERY bite... or so they said. Then again... empty plates don't lie. Drake polished his meal in 30 seconds flat and was off to the races with his Dump Truck & watching Gabba, which he had playing in the bed of the truck at the same time. He was so happy. What Drake lacks in vocabulary he sure makes up for in facial expressions. We couldn't have planned a more fun or relaxing way to spend Greg's Birthday Weekend, nor have I ever seen him happier. We're so blessed, thanks Mom & Dad Updike for letting us enjoy such a beautiful retreat. We're already counting down the days until Christmas and we're there again.